Looking for a Gmail App for Windows 10, or for other Windows versions? Would you prefer checking your emails from a Gmail Desktop App – rather than log onto a browser like Chrome? 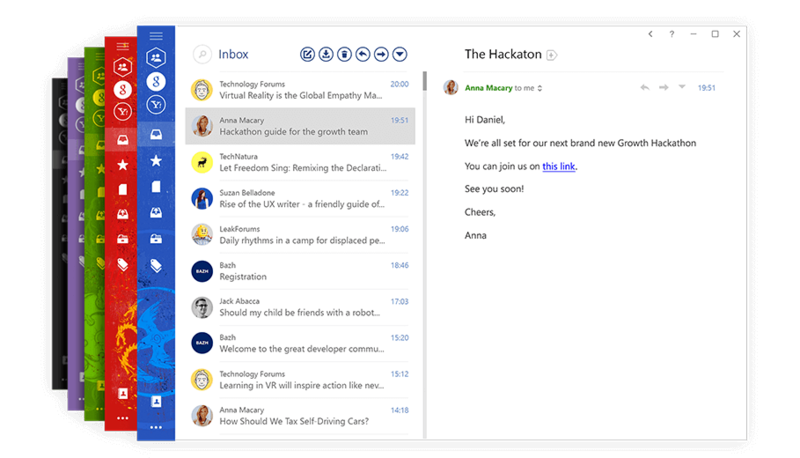 Enter desktop email clients for Windows 10 and other versions of Windows. 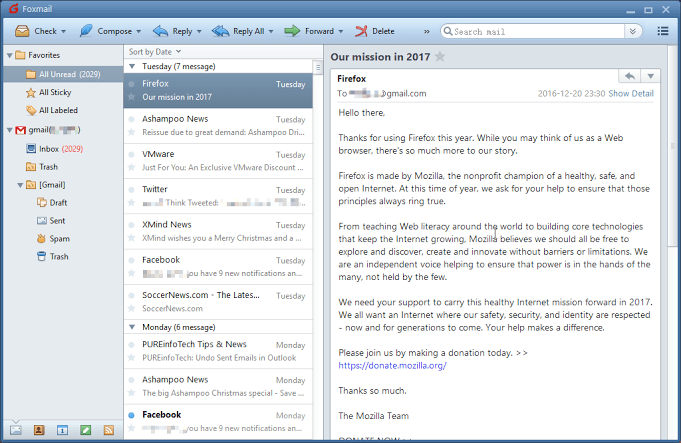 Email clients like Mailbird, Foxmail, Opera Mail, etc. sync with your mail account and allow you to access your Gmail (and other email accounts) straight from your desktop. Just open the Windows start menu, click on the app and access your mail! Let’s check out the top 5 desktop email clients for your Gmail account in 2019. 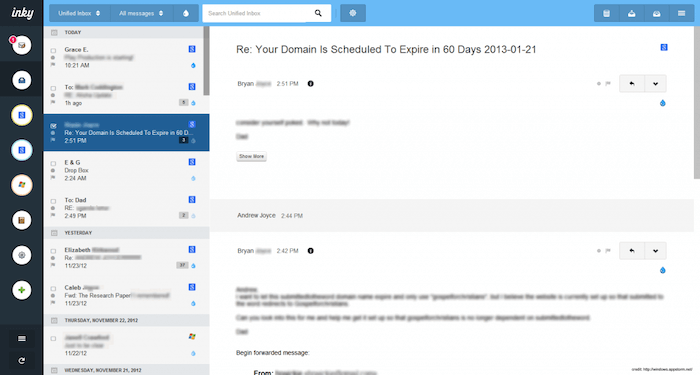 Mailbird isn’t just another ordinary Gmail desktop app! We’re more than just another good mail client. We also unify all your communication channels. You’ll be able to breeze through your gmail inbox and do much more. Mailbird lets you connect all your email accounts (Gmail, yahoo mail, your microsoft account email and other webmail clients – anything really) all into one integrated email client. You have access to all your mail in one unified space. Say goodbye to juggling different apps – each with their web app password. You can also manage accounts by color coding each of them separately. You‘ll never make the mistake of mixing up different accounts. What’s your worst thing you could see when you open Gmail? Tons and tons of unread emails in the general tab of your gmail inbox. You’ll never forget that snoozed mail. You’ll receive notifications and reminders at a specified date so that you can respond to them with ease. An average employee receives over 100 emails at work a day. Replying to every person can be a headache. But what can get really messy is replying to emails with a series of questions and different statements. You could easily overlook a question. You could avoid this disaster with our in-line reply feature. This gives you the ability to respond to questions or statements in incoming mail directly underneath them. Check the image below. Notice how this feature will save you time? With Mailbird, you can do so much more when it comes to attachments. No need to spend an entire hour searching for that attachment you received weeks or even years ago. With Mailbird’s attachment search feature, simply type in the file name. And voila – it’s there for you! We’ve all received suspicious work email messages from time to time. Sometimes though, it could be an important document. 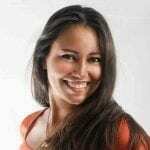 So what do you do – ignore it or risk your PC’s security? With Mailbird, users don’t have to choose. The attachment preview feature lets you take a look at what the document contains without having to open it at all. Without your contacts, there would be no emails. So it’s understandable that your contacts need to stay at the forefront of your email process. 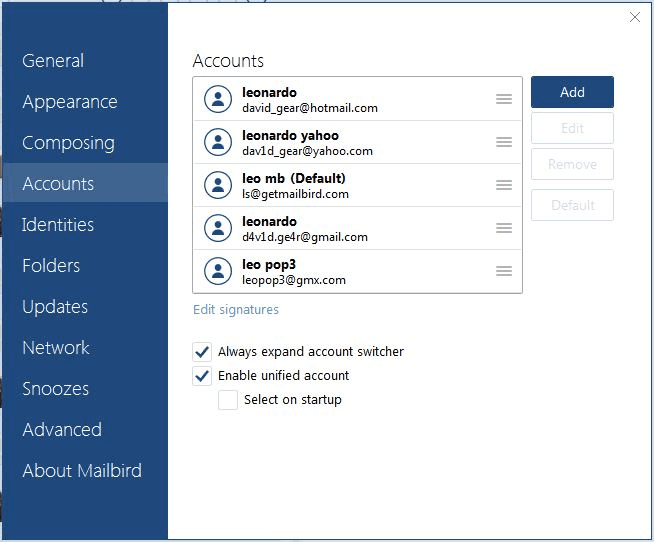 Mailbird makes it ridiculously easy to select and import contacts from your Outlook and Gmail accounts. Adjust your gmail settings and permissions and there you have it – all your contacts in your new gmail client – in a matter of 20 seconds! Mailbird makes it easy to automatically merge duplicate contacts so that you’re not sifting through people twice when drafting a new email. If two contacts aren’t listed down as 100% similar – you have the freedom to choose the default email and contact details manually. Mailbird makes copying contacts from different email accounts and placing them into groups a piece of cake. 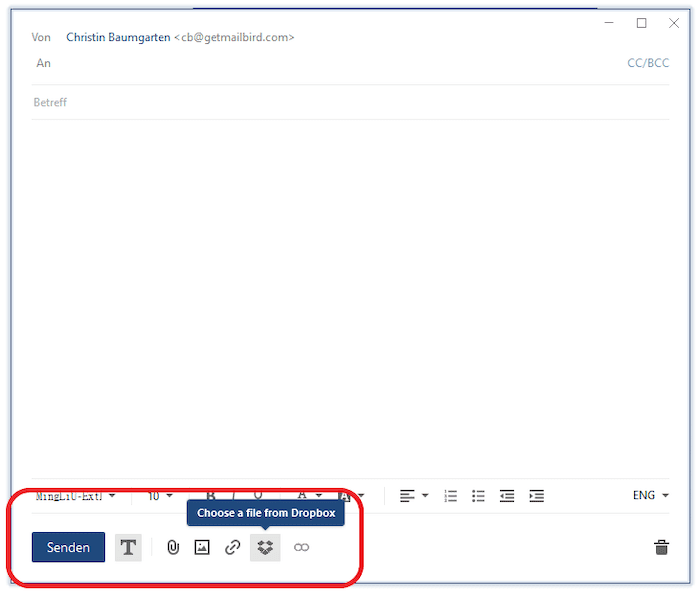 Simply drag and drop a contact from your email account into where you want them in Mailbird to create a new set. We’re super proud of this feature. Did you know that people spend around 2.5 hours on average daily reading emails? That’s an unbelievably long time! To help reduce that, we’ve tried to create a speed reader that displays one core word at a time so that you can stay focused and zip through your email messages. Users can speed up the process by 3x as a result! 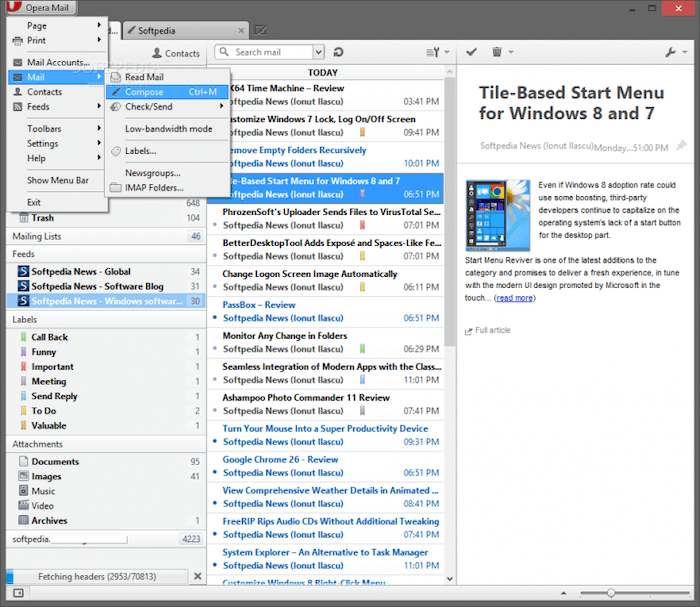 We’re the only free email client app in Windows to offer this feature. Check out some more info on our tech in this TechCrunch article. Setting up most other mail for Windows is complicated, confusing, time-consuming and buggy! That’s why we have made Mailbird so easy to set up! When you open Mailbird for the first time, you’ll have to adjust the account settings. This is a lot like adjusting your gmail settings for the first time. You’ll first be met with an “Add Account” dialog box. Put in your name, default email address and password and Mailbird will do the rest. To add additional personal email accounts, right-click on the Menu tab at the top left of the screen, and it’ll open up a drop-down menu. You’ll now be prompted with a Network Settings icon. Just add your email and password there, and the system will automatically detect the server settings – it’ll know if it’s a POP3 account or if it’s IMAP email service. Now you can customize the email app settings to suit your preferences. You can add a profile photo by connecting to Facebook. Or you can skip this step entirely. You can now customize the design options regarding layout and theme. You could choose a light theme, dark theme – or customize one entirely! You could use the typical on-screen gmail keyboard or use a custom keyboard too. Same goes for your layout – Mailbird will adjust it all to your preferences. Don’t worry about making the wrong choice – you can always change this later. You’ll then be asked to select which integrations you’d like to add from a drop-down menu such as Slack, Calendar apps, etc. Just add your web app password and details for each of these apps and click Continue. 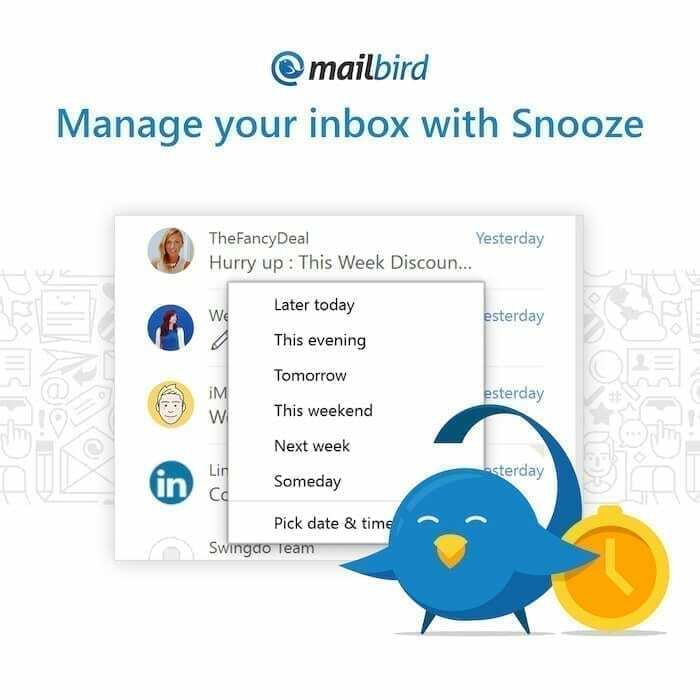 Mailbird can integrate with numerous different apps – be it calendar apps like Google Calendar, productivity apps like Asana, grammar apps like Grammarly, file uploads apps like Dropbox – you name it. Keeping track of all the mails you have to reply to isn’t easy. To help you, Mailbird can integrate with Followup.cc – a service for follow-up notifications. You can use the Followup.cc addon to schedule follow-up reminders and notifications right from within the app itself. Just click on the icon in the mail, and it’ll give you a drop-down menu where you can select when you want to be notified. This way, you can send out replies with ease. To help send large attachments, Mailbird can integrate with Dropbox. Just link your Dropbox account, and you’ll see the icon at the bottom of the compose window. Just click on the button to add attachments from Dropbox to send them. Attachment uploads were never this easy! Sometimes, you need more than emails to get the message across. Do you sometimes prefer a Whatsapp text, a Slack message or a Skype video call? Why not let your gmail client operate as a task manager too? To help your team collaborate better, we’ve teamed up with the popular video conferencing app Appear.in. 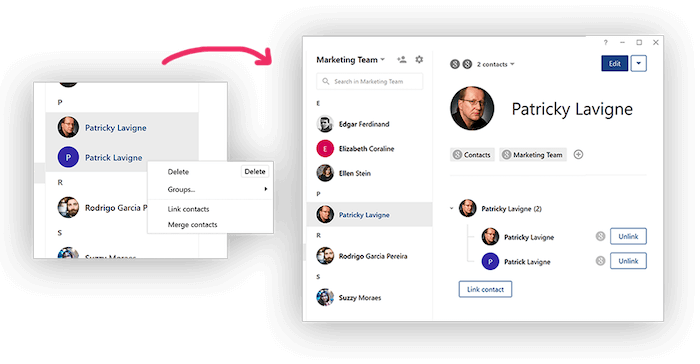 You can create ‘rooms’ for your team and hop on a group call with them instantly.You can also browse through your mail and attachments mid-call. 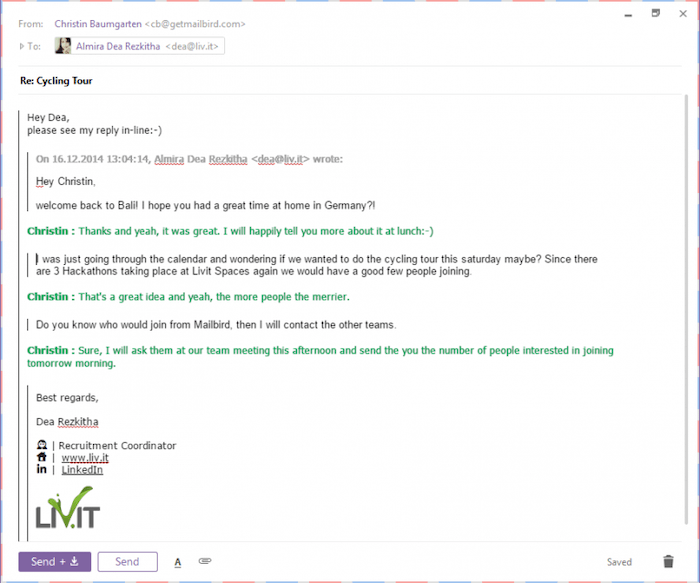 Mailbird also integrates with Slack and Whatsapp so you can have instant conversations! You can do all this without downloading any additional software. We’re working on a mobile app for Mailbird too. Soon you’ll be able to find Mailbird on your mobile device – be it an android, iphone or ipad or even among the Windows Store apps! Is not available as a mobile app yet or on an App store like the Windows Store or PlayStore. You’ll have to download it directly from the Mailbird website. Mailbird offers you a Lite version that’s completely free. With it, you get support for POP and IMAP accounts, a Contact Manager and a whole list of integrations. You’ll also get access to a free 30 day trial of our Pro variant once you sign up. You can get the Pro version for an annual fee of $12/year. Alternatively, you could opt for a lifetime subscription for a one-time fee of $33.75. 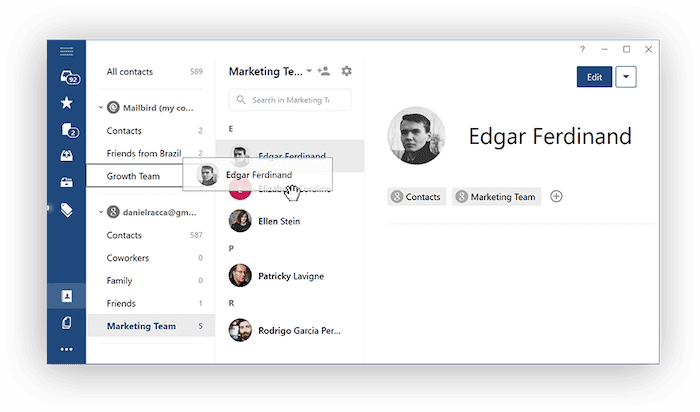 Unify all your communication tools into one beautiful desktop app. Foxmail is akin to its namesake from the animal kingdom. Just like the sly fox, Foxmail is a speedy email client for Windows with a few tricks up its sleeve. 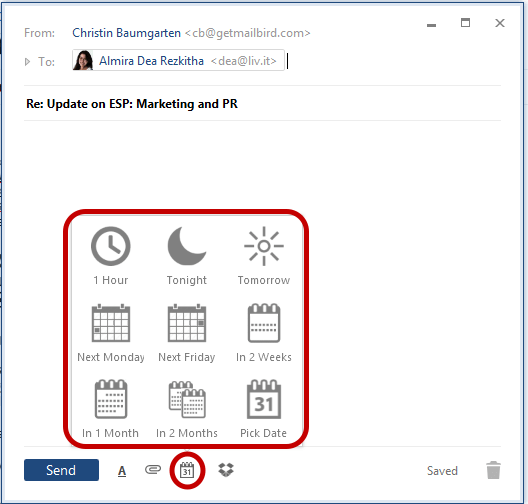 The latest reiteration of the Foxmail desktop app closely resembles Outlook – although far smoother and less cluttered. Anyone familiar with an Outlook tab should be able to transition to this desktop application quite painlessly. Want to know what the app offers? Foxmail provides you with a helpful notepad button feature in the tab that allows you to record notes while working. You won’t have to use reminders or another app to note down and compose valuable information that you find in gmail messages. They’ve also tried to make it user-friendly by giving you a reply, delete and forward shortcut button at the top of the compose window screen. It makes moving through gmail messages in the desktop application super easy. The major drawback when it comes to this gmail desktop app is that the default installer isn’t in English. Additionally, users have to restart the application every time any change is made to the sync settings. However, their website does state that they will be able to support Outlook mobile and have a mobile app for your iphone and ipad and android device soon. If you’re looking for a desktop email app aimed at mail for Windows – Opera Mail could be a good addition to your Windows start menu. Opera Mail originally debuted as one of the web apps alongside the Opera web browser. 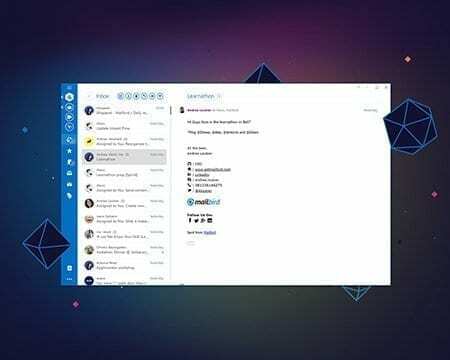 At the time, it was one of the best Windows email clients. However, while it’s still a solid offering to manage accounts, it’s in dire need of an overhaul. Not what you would expect in a Gmail app for windows 10. There are a lot of things that Opera Mail does right though. For one, you can add more than one mail account to it. Secondly, it supports POP and IMAP , along with Atom, and RSS feeds. Lastly, Opera stores all your data on an indexed database. As the data is readily available, reading, labelling and filtering all your mails is easy. You also have the option to add custom tags to certain people or mails. This way, you can highlight and demarcate any priority targets with ease. A big issue with Opera though, is its mailbox sync settings. The sync settings doesn’t allow you to import data from other modern email clients easily. This was the case even back when people used Windows Live Mail. Trying to configure Opera Mail has always been a difficult task. As a result, trying to sync all your contact details into Opera Mail isn’t always possible. Inky is a good option when it comes to Windows mail apps. The first thing that hits you about it is how much the app offers you in terms of security. They go above and beyond when it comes to ensuring the safety of your information. Inky automatically incorporates end-to-end encryption and digital signatures on the outbound and incoming mail server. As a result, your mail account, app password and email address will never get into the wrong hands. Good luck hackers, you’re not getting in here. Apart from their security features, Inky in itself is a great email client. Their mail app for Windows works with all POP accounts like Gmail, Yahoo and AOL. It’s also compatible with IMAP and Microsoft Exchange. So you can manage accounts easily. The only issue with Inky is a lot of their additional features are limited to their pro and enterprise versions. While their free version supports Gmail, Windows Live/Outlook and Mac clients like iCloud, you get access to Microsoft Exchange, Office 365, Google Apps and other IMAP accounts only with the pro version. The Enterprise email program gives you customised solutions, volume discounts, phone support and MDM/EMM solutions. Another issue with Inky, is it’s reputation for being glitchy. You may have to open up Task Manager to manually close and restart it on occasion. In many ways, Inky is a lot like EM Client – another desktop email client with good features but limited by their free offerings. So while Inky is a great Windows mail app, for you to truly enjoy it, you’ll need to get the paid version. Inky’s pricing details aren’t mentioned on the site – however they do mention that pricing is based on per mailbox per month. They also offer you volume discounts and special pricing for educational and nonprofit customers. Claws Mail is another good gmail app for Windows 10. One of the coolest things about this email service is that it’s an entirely open-source project. What that translates into is an ever increasing set of tools, tabs and add-ons for it’s email program. Insiders get access to new features before it is rolled out to the general populace. Additionally, it doesn’t have a limit on the number of email accounts you link. Another thing that this client for Windows does really well is their filtering. You can flag mails by sender, age, phase and more – making gmail inbox organization that much easier. It’s definitely a step in the right direction for anyone focused on getting a zero inbox on your device! But it’s not all rainbows and unicorns. Claws Mail has its shortcomings. The user interface is a lot like a web browser – not a sleek one like Chrome, but rather a really dated one. 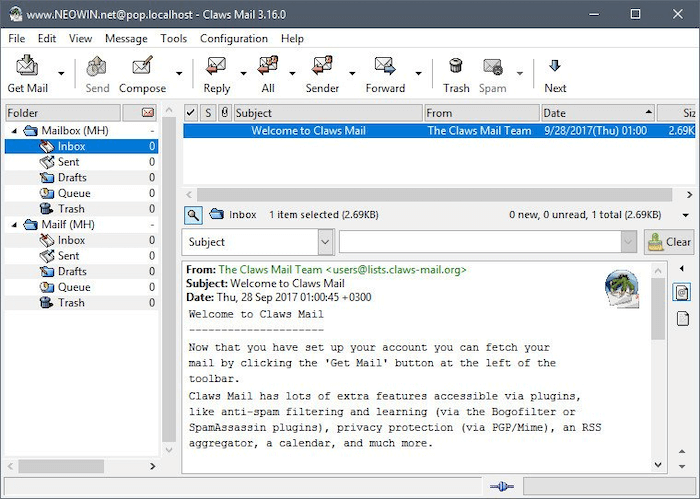 On this feature, Claws lags behind Mailbird, Thunderbird or Easymail. Secondly, when it comes to server settings, there’s no automatic setup for POP accounts like Gmail, Yahoo and Outlook mobile. Therefore, onboarding here for inexperienced users can be quite a task. These are the best options for Gmail app for Windows 10 in 2019. Of course, there are other Windows 10 mail clients as well, such as EM Client ,Kiwi for Gmail and Easymail. But we have covered the key ones. Have you decided which is app to access your mail for Windows? Why not try Mailbird first before you give a final verdict? You don’t need a credit card to sign up and installation takes just a few seconds. To switch to Mailbird to start supercharging your email download the free version! Still looking for the Best Gmail App for Windows? Search no more. 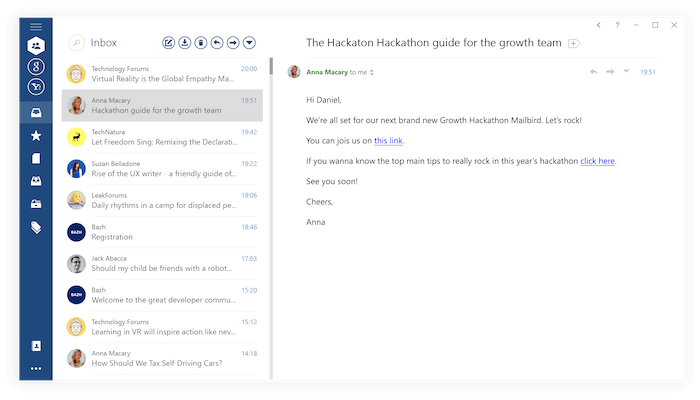 14 thoughts on "Best Gmail App For Windows 10: Top 5 Tools Reviewed (2019)"
Really annoying kinda’ OCD of me but in your description of Mailbird it has you “desinging” Mailbird, and I don’t think you have meant that you have taken the bird’s song away. Trivial I know, but I can’t help it. It’s not OCD if you don’t immediately recognise it as a typo and have to stop and wonder what it means. I thought it was software-developer jargon. Foxmail installs in Chinese and nothing I can find will fix that. There are posts that say remove the file Chinese.lgb, from the installation folder. For some reason or other it installed itself on drive D and the file Chinese.lgb wasn’t there. Foxmail is tricky to install, but it works very well. It always installs in Chinese. Go ahead and install it. After it has installed, go to D:Program FilesFoxmail 7.2Languages in your files. You will see three language files. Simply delete the two CHINESE files, leaving only the ENGLISH file in the folder. Now you can open your Foxmail, and everything will be in English. Important Note: Google will not allow Foxmail to log you on to Gmail unless you lower your security settings to allow for “less secure” apps. Unfortunately, there is no option to choose which apps can access your account, right now. It’s either ON or OFF. Hopefully, this will change in the future. In the meantime, make sure that your Google password is something no one could guess, and do not share it with anyone. Which one is the lightest? The least in using memory? which one of the imap enabled and is the lightest? The least memory using. Which is the one least likely to break on Windows 10? EMClient has stopped working, and now Operamail too…..
Why don’t Google provide their own windows email client? I’m not a fan of the browser interface. I like its usability as it mimics Gmail but I don’t have to open the web browser to access it straight away… best thing is that it syncs everything I do with Gmail so when I go back on in the browser I everything has been completed. Yes! plus we have a ton of awesome efficient features that help you free up the time you would otherwise spend with your inbox. Thanks for choosing Mailbird Stephen! After installing and trying out Mailbird for a day, I’m pleased by its functionality, although I hope a Fluent Design version is in the making, because the interface looks outdated. Also, I couldn’t find a setting for how long back I want to sync my inboxes. That said, I’m not a fan of reading sponsored product comparison articles. Well done to the author, but to dedicate five times as much text to Mailbird as the other clients is not even subtly unfair. The only thing that makes this article even more unfair is to compare Mailbird to second-class email clients, while leaving out competitors in the same league, such as eM Client, Thunderbird, Outlook or even Windows Mail. I will stress again that I do like Mailbird, having tried three different mail clients in the past week, and I probably will buy a one-year subscription, I just don’t like the unfairness of promoting yourself by comparing yourself to weaker competition while withholding any info about stronger competition.